They call it The Great American Race, but it is so much more than that. The Daytona 500 is stock car racing’s Opening Day and Super Bowl, all rolled up to the starting line in the noisiest package ever assembled. If you love racing, this is an item on your bucket list. If you like to walk among the Beautiful People grab a ticket that lets you into Pit Row a half hour before the race. Because, this is a one-of-a-kind event, and it is happening this week. Today, Gildshire shares the things you need to know as a first-timer to the center of the racing world. February is spring in Florida so you won’t need the snow boots you’ve worn for the last three weeks. That said, this can be a tricky time of year in this part of the country. Chances are, the race will start with temperatures in the low to mid-60s. But, it will last until after dark when the temps could be in the lower 40s. A few years ago rain delays kept the race going until after 11 pm. First of all, you don’t want to waste a Bucket List day by lounging around a hotel. One Continental breakfast is pretty much like every other Continental breakfast. Early arrivers at the track can grab a free shuttle from the outer lots and skip the pay-to-park lines later on. Isn’t that true of everything nowadays? The Daytona 500 app will tell you where the drivers are hanging out pre-race. NASCAR drivers are famously friendly with the fans and popular among the ladies present. Sure, you could follow the squeals, but the app is your best bet. Why should this vacation be any different? But, this one is particularly true at the Daytona 500. There are vendors along the main access road that takes you through the infield. The food offerings are from all regions of the country, but are uniformly great! On this same route, there are souvenir stands as far as the eye can see. Buy something that celebrates your favorite driver, or that celebrates the Great American Race itself. Every auto manufacturer in the world will have displays and exhibitions running all weekend long. The Heritage Museum exhibits cars that ran in the 500 over 30 years ago. Trust me, you would not have been received very warmly if you had asked to walk on the field before the Super Bowl. At Daytona, you can walk up the 18-degree start/finish banks to the wall. That opportunity alone makes this a trip of a lifetime. 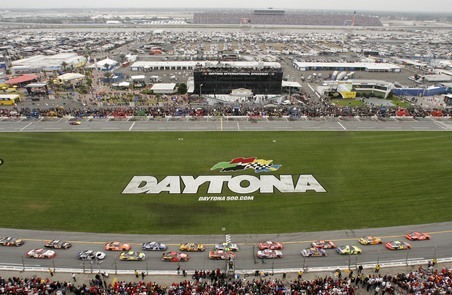 The first lap of the Daytona 500 brings the huge crowd to its feet. You will read elsewhere that ear protection is a must at the Daytona 500, but Gildshire has a different take. Yes, if you have small children with you, their ears should be protected from the noise. Yes, if you are seated in the first ten rows, trackside, consider ear protection. For the rest of us, though, the thunder is part of the fun here. (Say that out loud. It almost rhymes.) Let the noise that is the celebration of internal combustion wash over you as you have the best time you’ve ever had listening to cars fly by. It’s race season, Bubba! Let the good times roll!